What SEO Services Do You Offer? TLDR: I tell you EXACTLY what you need on your website to rank in Google. Every Google Search in unique. Every business has a unique situation. 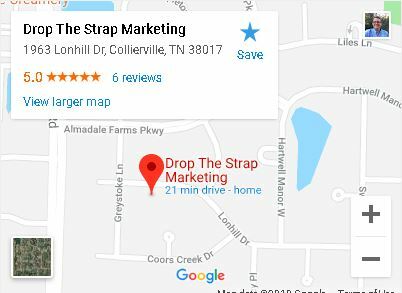 If you are looking for white label Ranking Reports to deliver your clients, you are missing the value of Drop The Strap Marketing‘s Knowledge. ✅ Keyword Research: Where EVERY project begins. Find the search terms clusters most valuable for the goal of the business. Determine what search terms are worth spending time and money to rank. Create a page for each targeted search term cluster. Determine the necessary on-page content for each page. Determine the best website structure for achieving our ranking goals. ✅ For Existing Website: Audit how the existing website is ranking for the most valuable search terms? How does Google “see” the business online? What is the Technical SEO Health of the existing site? What existing pages are ranking in the top 100 search results for the most valuable search terms? Should we update existing pages to rank higher? Should we publish new pages? ✅Website Speed: Fast pages rank higher! How fast is the page loading? How fast is the page loading on Mobile? How fast are the pages loading that are out ranking us? [Notice] We do not know the cost of going after a search term till after we have complete the first 3 steps. It’s only 2 steps if we are starting with no website. Find the search terms to go after > Audit what Google is ranking for those search terms > Audit what we have > then we determine the cost to go after those ranking. The first page of search results might be thin content that anyone could create in a day. OR the first page might be full of long form 5,000 words epic content with images and video written by an industry professional. We don’t know what we need on our soon to be ranking page till we learn what Google wants to see.